Dada Aktuell is a night of readings, music and film to celebrate the 100 anniversary of Dada. As many of you might know, Dada was born in Zürich. 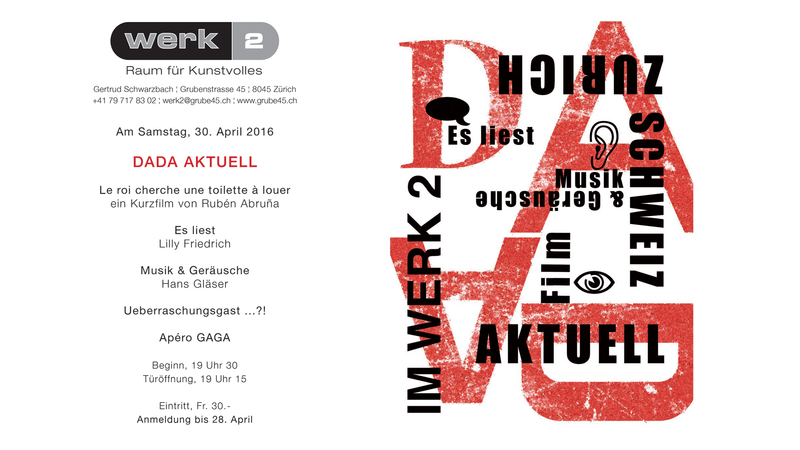 My latest film will be screened at Dada Aktuell. (See invitation below). “Le roi cherche une toilette à louer” by Rubén Abruña. Hand printing, cutting words, mental sounds, and random acts of poetry can lead you to unexpected places where the mundane blends with the sublime. Inspired by a “découpé” poem by Tristan Tzara, the film is a celebration of Dada’s 100 anniversary. Time: 19:30 (doors open at 19.15). If you live in Switzerland or are visiting, I encourage you to come and join us in the celebration. You will have a wonderful, unforgettable Dada experience!